When will be Jagger Eaton's Mega Life next episode air date? Is Jagger Eaton's Mega Life renewed or cancelled? 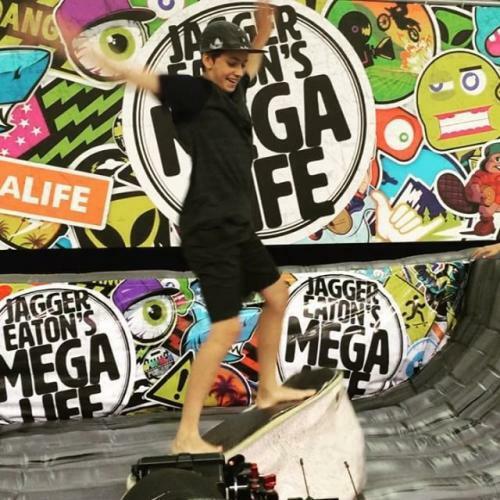 Where to countdown Jagger Eaton's Mega Life air dates? Is Jagger Eaton's Mega Life worth watching? As the youngest ever X Games competitor, Jagger Eaton knows what it's like to live life to the fullest! Don't let the extreme tricks and big trophies fool you – Jagger's just an ordinary kid living an extraordinary life, always trying to learn more and go bigger. Follow his newest and greatest adventure as he skates the world looking for people who are the absolute best at what they do, all while performing unbelievable feats along the way! Whether in skateboarding or real life, Jagger knows it's go big or go home on Jagger Eaton's Mega Life! Pro skater Bob Burnquist invites Jagger to his house to skate the mega ramp; Jagger and his friend Trey Wood race remote control cars, play volleyball and attempt a huge new trick on the mega ramp. Jagger and Jett travel to New York City to meet Olympic fencer Monica Aksamit; Jagger trains in order to beat his brother. Jagger wants to break a world record, so he and pro skater Chris Cole meet up in Los Angeles to try and break a huge one; Jagger and his brothers try to break a bunch of small, silly records. Jagger and his brother fly to Hollywood, Calif. to meet with stuntman William Spencer so they can live out their dream of becoming real life action heroes. Jagger Eaton's Mega Life next episode air date provides TVMaze for you. EpisoDate.com is your TV show guide to Countdown Jagger Eaton's Mega Life Episode Air Dates and to stay in touch with Jagger Eaton's Mega Life next episode Air Date and your others favorite TV Shows. Add the shows you like to a "Watchlist" and let the site take it from there.